The medical establishments of Russia and Ukraine admit a high level of bycicle Pneumo&cardio complexes "Analyzer-15", that have received diplomas of international exhibitions. At the customer's will it is possible to deliver cardio complex without the block of the pneumochannel collection. Pneumo & cardio complex works under control of personal computer. 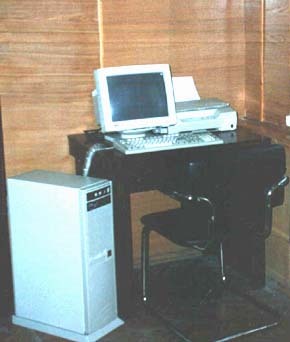 The complex can be delivered with the computer or be connected to the computer being available to you (minimal requirements are: AT/486, SVGA monitor, russificated printer). 14-channel pnuemo & cardio analyser (12 ECG channels, 2 pneumochannels). Block of ECG collection with proof and complete of electrodes and belt of electrodes' fixing. Block of the pneumochannel collection with masks and pneumo conductors. Package of the diagnostic program. Research of ECG in twelve loads with formation of the ECG-conclusion (morphologic analysis and diagnostics of aritmias). Research of functions of external breath at fulfilment techniques of MVE, VE, MVL, FVE with a displaying "flow - volume" curve. The conclusion about obstructive and restrictive infringements in lungs functions. The session on universal techniques load, is supported given load irrespective of speed of rotation. 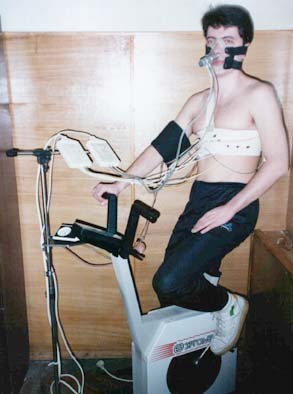 pneumochannel (diagnostics of breath system). suppression of network and myoelectrical noise, stabilization of drift line, digital filters. Choice of sensitivity (5-40 mm/mv). Storing whole кардиограммы of inspection for selective listing. Display of diagram load, HR, BP and double product. Analysis of gas excanges parameters: consumption of oxygen, oxygen pulse and other parameters with account of work cost oxygen, maximum consumption of oxygen and peak efficiency of breath.